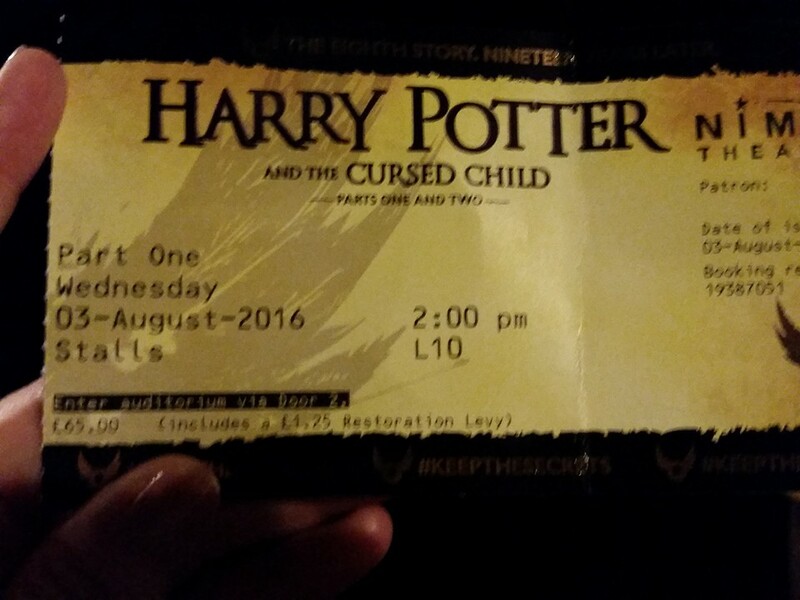 A few months ago, after I booked plane tickets for my trip to England, I had 3 tickets for the Harry Potter play in my online shopping cart at the HarryPotterThePlay.com website. Unfortunately I didn't check out fast enough and lost them, and before I knew it they were all sold out until May 2017. I searched various options, signed up for the wait list, looked on Ebay and StubHub (way too expensive! ), and waited to try the Friday Forty (where 40 tickets are put on sale each Friday for the following week). In the end, I decided to try my luck in person. We planned to be in London a few days after the opening of the play, and decided to try out for some return tickets. We got lucky and here is how! Returned tickets are those which someone no longer wants. They are given back to the box office and resold. They cannot be purchased on the website, but only at the box office on the day of the performance. I suggest you arrive early! We arrived as the box office opens, at 10am, but there was already a queue of about 30 people. I recommend arriving earlier as I literally got the last returned ticket as the show started. 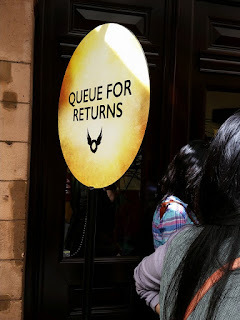 The procedure is that, as tickets are returned to the box office, a representative comes out and offers the ticket(s) to the first folks in the queue. There may be no returned tickets at all, there really is no way to know how many there will be. If there are any, the theater resells them at the actual price of the ticket and some are cash only (they let you pop to the ATM across the street, if need be). Ticket prices vary and the play is in 2 parts so you have to buy both if they are available. If the person at the front doesn't want to pay the price of that ticket, it is offered to the next person. This is how, with 5 minutes before the start of the play, we managed to get tickets! Full price tickets came up and even though we were not yet at the front, we were the only folks willing to pay for them. We were not all seated together but we didn't mind. Note though, kids under the age of 15 are required to sit with an adult, so if you are going with a child, you might have to wait it out for a pair of tickets. One other caveat--they only allow one ticket per person. You cannot line up and get one for anyone else. If your friend, spouse, kids want tickets too, they must be in the queue and wait it out like everyone else. 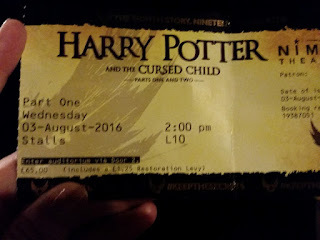 My ticket, as it turned out, was in a great seat--just a few seats from some of the stars of the films; Michael Gambon (Dumbledore), Helena Bonham Carter (Bellatrix) and Bonnie Wright (Ginny Weasley) were in my section so that was a great thrill! 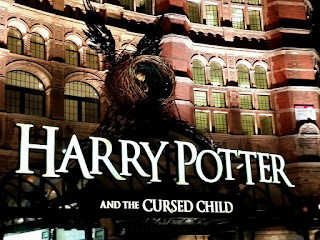 I loved the play; the magic was great and some of the characters were wonderful. The story itself didn't live up quite as high as my expectations but I admit that my expectations were extremely high. The whole experience though was tremendous and I wouldn't miss it for the world. If you want to get tickets for next year, as of this morning, there are still a few tickets available on the website but not many. The site say some returned tickets will come available through the site on occasion (especially tickets returned by touts, as they do have systems in place to try to limit touts selling tickets). Not getting to London any time soon? 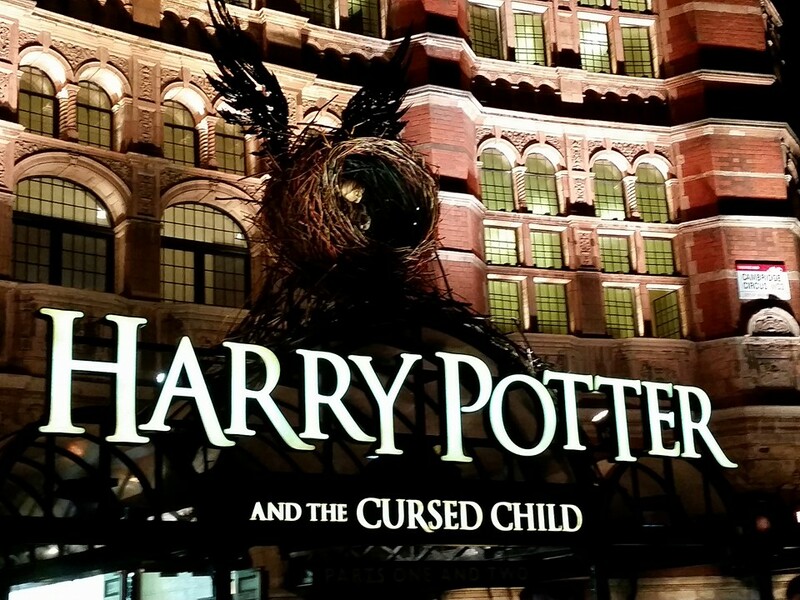 Well you can get the Cursed Child script from Amazon, along with a pre-order of the script of the new film coming out this fall, Fantastic Beasts and Where to Find Them: The Original Screenplay.